Wedding Reception at Gregynog Hall & Gardens01686 650033work Wedding Reception VenueGregynog Hall is without doubt the most romantic of locations, laced with symbolism from the times of the Princes’ of Wales and cultural significance. Impress your wedding guests with the exquisite good taste of the Davies Sisters, in a building where Renoirs, Monets and Picassos once hung and Rodins still stand. 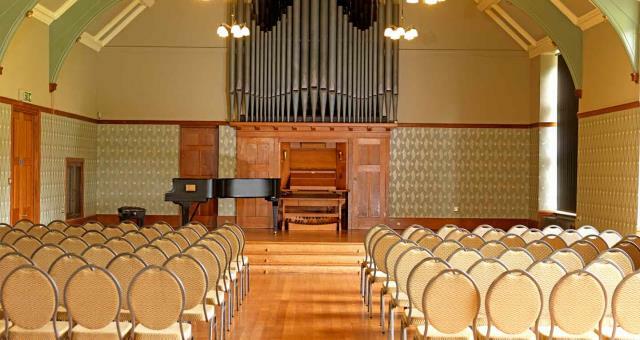 Four of our historic rooms are licensed for civil ceremonies from the Music Room, which seats up to 180 people for a ceremony, to the Blayney Room, with its fantastic oak carvings from the 17th century. This leaves the Library, with its Art Deco furniture and Senior Common Room, with grand piano and fine works of art, for smaller ceremonies. At Gregynog, we offer a genuinely warm Welsh welcome and are focused on providing the best service available. We have held a coveted ‘Hospitality Assured’ award since 2002, and each year our guests give us a satisfaction rating of over 85%, which is proven by high levels of ‘word of mouth’ recommendation. If you wish to hire the whole house, then bespoke packages including the bridal suite are available, providing both privacy and exclusiveness for your wedding. Gregynog Hall is without doubt the most romantic of locations, laced with symbolism from the times of the Princes’ of Wales and cultural significance. Impress your wedding guests with the exquisite good taste of the Davies Sisters, in a building where Renoirs, Monets and Picassos once hung and Rodins still stand. Personalised wedding packagesare available. Unlike many historic houses, Gregynog has maintained its flexibility, added this to imagination and insight, to create individual weddings and personalised packages. You will find that we can provide precisely what you require, including grand marquees on the lawns to a tranquil afternoon of croquet.